I've been trying to make my hooks and especially my metal/wood hooks as ergonomic as possible. It works pretty well, and most who've bought my wood hooks will say they fit well. Here is my latest handle design with ergonomics in mind. This hook fits my hand very well, with the gentle swell in the middle just fitting the contour of my thumb. Works best with the underhand toothbrush kind of grip, but i'm finding that the swell also fits the curve of my index finger and thumb in the pencil grip style too. I'm anxious for the buyer to try it out, and excited that this shape might be just the ticket for folks with hand problems. The hook is a Boye H. I can now truly empathize with the wimmen who took their own picture for the "post a picture of your grip style" in C'ville. Comments on the shape? Think it'll work? You can buy this style (well ANY of my hooks) starting at $15.00. but of course the one i have is perfect.. i have small hands so huge handles dont work out so well for me ! Thanks for your comments, guys. Sorry i didn't respond right away, but blogging is still a bit new, and i'm not sure about replies and whether they get to you or..
Well anyways, i appreciate your comments and hope to have lots of orders for more wood/metal hooks. 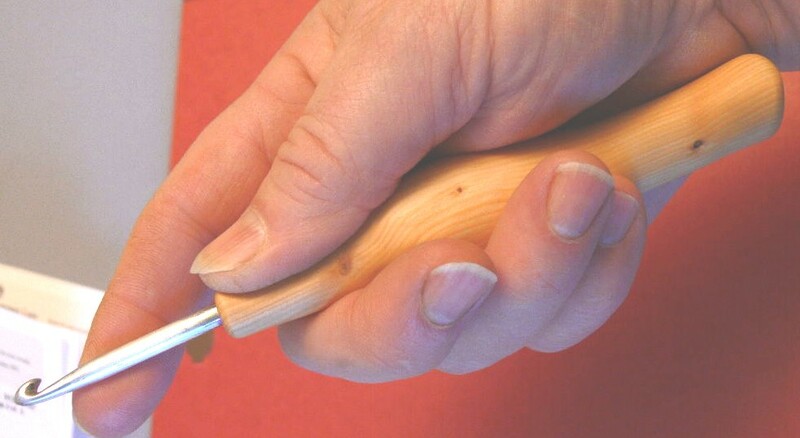 The combination lets me offer alot smaller hook sizes than i could ever carve effectively, yet be able also to fit the hand as well as possible.